So, it’s been a while. Again. And this is going to be short. Sorry about that. Maybe I can appease you with the good news that, a) this is not another grammar rant, and b) I come bearing Very Cheerful Tidings. Very Cheerful Tidings Exhibit I: I have finished this edit of Novel #2! Very Cheerful Tidings Exhibit II: I have exactly one run-through left of Novel #2, in which I shall conduct a final grammar check. After that, I will endeavor to gain constructive criticism from mine peers. Then—to querying! Very Cheerful Tidings Exhibit III: …Actually, I don’t have a third Exhibit. I just wanted one. So there. Thus concludes this Brief Message Bearing Very Cheerful Tidings. I know I haven’t sounded all that understanding of grammatical errors recently. “Another Grammar Rant” was impassioned and frustrated; “Ode to the Em Dash” was both pretentious and angsty. I know what I sound like when I rant about grammar, what I sound like when I rant about anything I care about. I know what I sound like when I’m whiny. I will freely admit that part of my love for semicolons exists because using them makes me feel correct and intellectually superior. That’s not why I’m a grammar Nazi. Not entirely, at least. Not even mostly. Recently, I’ve been trying to find some inkling on the Internet that what I do is appreciated, even by a sliver of a minority. Instead, I’ve found scientific studies “proving” that I, being a grammar Nazi, am a jerk; I’ve found grammatically incorrect memes telling me I, being a grammar Nazi, am ridiculous; I’ve found people who are convinced that I, being a grammar Nazi, exist only to make their lives painful and annoying; I’ve found entire articles intent on proving that I, being a grammar Nazi, am just a bully who is insecure and unwilling to reveal my own imperfection. Even the kinder things I’ve found have been purely to tell me to be more compassionate, like I’m not already. To tell me just to give up the greatest passion in my life. Let me say this now, World: I won’t. I can’t. This is who I am. I cannot speak on behalf of every other grammar Nazi in the world. I cannot say that every grammar Nazi is not a scientifically proven jerk, is not ridiculous, does not exist to make others’ lives painful and annoying, or is not an insecure bully who attacks others’ imperfections to conceal his own. Last night, at approximately 5:30 PM, something momentous happened: I finished rewriting Novel #2 with a final tally (for this draft, at least) of 67,841 words. OH MY GOD, I, LIKE, TOTALLY FINISHED MY BOOK AGAIN! AND NOW I GOT TO, LIKE, EDIT, AND IT’S GOING TO BE A. MAZ. ING. Totes. 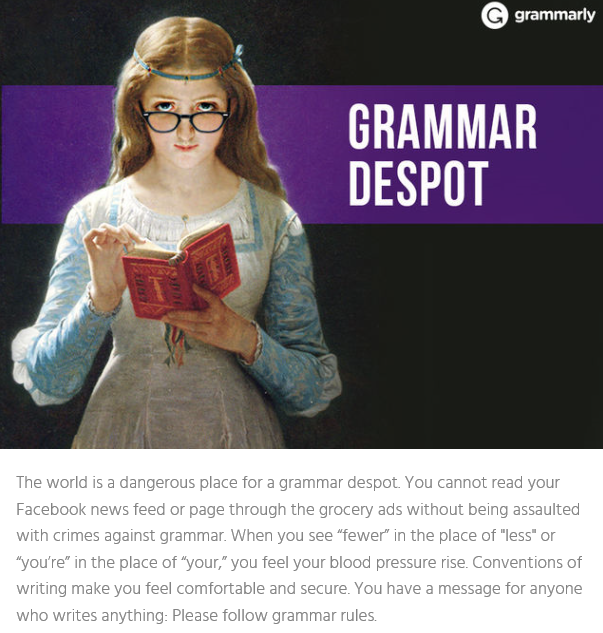 Note: this post is not meant to shake the tree or ruffle feathers – it’s just a different perspective on grammar and words. :-) Please realize I wrote all of this with a smile on my face and lighthearted intentions. Well, what a turn out huh? Bet you never thought you’d ever see me finally pick up my pen (or keyboard as it is…) and devote an hour or so to a blog post. As you see, I am now. I know, it is long over due. I apologize immensely and could spend my time convincing you that I am truly sorry or we could just accept it as understood and move on. On November 16, 2015, you declared the “face with tears of joy” emoji the 2015 Word of the Year. In addition to expressing the churning abyss of sorrow and loss and unwavering rage that this has evoked within me, I am writing this mock-letter that you will likely never see in order to inform you that November 16th will forever be the day that you, one of the most respected dictionaries in the English-speaking world, let down everyone who speaks or wants to speak the language and defiled and ridiculed the great tool and art that is our language and the use of it. Because I am just this nerdy and couldn’t help it. And because it’s fun.